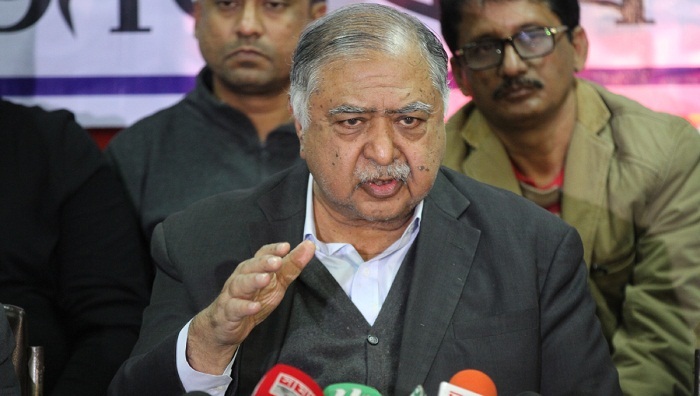 Jatiya Oikya Front convener Dr Kamal Hossain on Sunday appreciated the Prime Minister’s decision to hold fresh talks with political parties, saying it is a positive step. Talking to journalist, he also said they will take a positive decision about joining the dialogue with Prime Minister Sheikh Hasina after discussions with their alliance partners. “I called upon the government for holding talks with political parties to find an effective way for holding a fresh credible election. Now the Prime Minister herself has decided to hold talks. I hail the decision, and it’s surely a positive initiative,” Dr Kamal said. Once they get the invitation to join the talks, he said their alliance leaders will sit together and fix what they may discuss with the Prime Minister during the dialogue. Dr Kamal also expects a positive outcome in favour of the country’s people if the dialogue is held with the Prime Minister. Earlier in the day, Awami League General Secretary Obaidul Quader said Prime Minister Sheikh Hasina will hold fresh dialogues with the political parties that joined talks at Ganobhaban before the December-30 election. He said the Prime Minister will send letters to Oikya Front, Juktafront, 14-party, Jatiya Party and other political parties inviting them to engage in talks at Ganobhaban to discuss various issues. At a discussion on Thursday last, Dr Kamal Hossain called upon the government for holding a national dialogue to find ways for arranging a fresh national election as per the constitution. However, Obaidul Quader on Friday turned down the call for talks and terming it an absurd demand of Oikya Front. Two days later, the Awami League general secretary said the Prime Minister at a joint meeting of their advisory council and the central working committee on Saturday said she will again invite those who joined the talks earlier. Before the announcement of 11th parliamentary elections, Jatiya Oikya Front leaders, led by Dr Kamal Hossain, sat twice with the Prime Minister on November 1 and November 7 last at Ganobhaban.